As I thought about the ox, it became clear which direction I wanted to take in its design and painting. I moved to New Jersey from Staten Island eight years ago to East Amwell, just outside of Hopewell Township. I enjoy the small town atmosphere and beautiful landscapes. I am surprised by the number of cows I see! 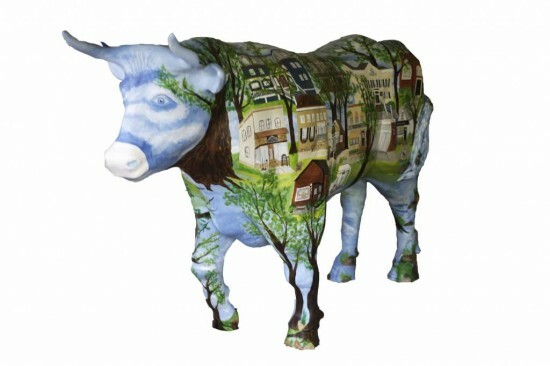 The oxen sculpture is the perfect canvas for illustrating the shops and businesses that are in the area that make it feel like a small town from a bygone era. The Hopewell Valley Arts Council is the exhibition sponsor, so I wanted to pay homage to this neighborhood that includes many artists who live and work here. I wasn't able to fit all the shops, but I am trying to get a good sampling of life in the town and its historic and not so historic buildings. I am also including trees and streams because I enjoy that part of living here. I used acrylic paint as my medium.